Nothing adds a distinctive air (and increased resale value) to your home like natural wood flooring. But hardwood’s beauty is just one of its many virtues. In case of damage to your wood floor, simply repair or partially replace the affected area -- there's rarely a need to pull up the whole floor. This will save you money and keep your flooring looking great for many years to come. Here we troubleshoot 7 common forms of damage to hardwood floors, and discuss how to fix them. Scratches and Scuffs. Often scratches and scuffs on a hardwood floor do not go any deeper than the finish coating, making them easy to touch up. For shallow damage, clean the surface, followed by a gentle buffing with steel wool in the direction of the grain, and then apply sealant and finish. Deeper scratches will require sanding the wood itself before resealing and refinishing. Always buff or sand in the direction of the grain. Cupping or Crowning. 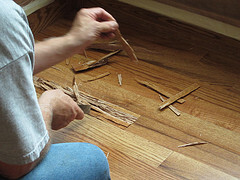 The term cupping means that the floorboards are distorted, with edges higher than their center, while crowning refers to floorboards which have become higher at the center than at the edges. Both are due to excessive damp, which could be caused by water spills, leakage, or overly high relative humidity. Clear up the source of the moisture first and allow the floor to dry thoroughly. Afterwards, sand the boards flat or replace them as needed. Buckling. Buckling of your wooden floorboards means that they have pulled away from the subfloor. This may be a reaction to more severe moisture than in the case of cupping or crowning -- such as flooding -- or to extreme fluctuations of indoor temperature and humidity. Alternatively, the condition can be a result of insufficient drying of the boards before the wood floor installation or inadequate perimeter clearance. It may be possible to correct the buckle by weighting the floor. Address the source of the moisture problem, too; a dehumidifier could be advisable. Mold. Black or white blotches or fuzzy patches are signs of mold growth, again caused by overly high levels of moisture in the home. Because mold and its spores are very dangerous to human health, the National Resources Defense Council recommends having a trained flooring professional, wearing protective gear, sand down the wood floor to physically remove the growth. Cleaning with bleach or other surface treatments is not enough to get rid of the mold spores. The moisture problem must also be remedied. Squeakiness and Loose Boards. A squeaky wooden floor comes from loose boards rubbing against each other, nails, or adjacent pipes or ductwork. The floorboards may have loosened as the result of contraction, due to an overly dry indoor atmosphere in winter. Introducing a small amount of humidity might help. Loose boards that present a tripping hazard can be fastened in place, from either above or below, by means of inconspicuous screws. Black Stains. Black stains on wood flooring are often an indication that a cat or dog had an "accident" in that area, which was not cleaned up promptly. Try sanding, bleaching if necessary, and staining the section to match the rest of the floorboards. However, pet urine is one of the hardest types of damage to repair, and partially replacement of the wood floor may be necessary. Burns. Small burn marks are usually due to cigarettes. Depending on the seriousness of the scorching, you may be able to remove the marks with a magic eraser, steel wool, sandpaper, or an X-Acto blade. (Sand after using this latter.) Restore the color with a touch-up pen for a small spot, or wood stain for a larger expanse.